I used to dread going on hospital visitation. When I first started going on hospital visits, I didn’t know what to say, where to look, or what to do. Thankfully, God not only placed some people in my life who shared some practical shepherding skills, but He also allowed me to practice ministry with some very patient church members. Over time, not only has my attitude changed towards hospital visitations, but I’ve also learned some helpful ways to shepherd in that environment. Shepherding the church God has called you to in moments of medical care includes the objectives of caring, sharing, and praying. Hospital visitations create an opportunity to shepherd people by caring for them through times of hurt and celebration. The tone of your visit and the care you give will change depending upon the reason your church member is there. Gathering a general knowledge of why they’re in the hospital before arriving will shape the way you approach your care. You may care for a family who’s been devastated by a tragic accident. Or you may be rejoicing with a church member whose cancer has suddenly vanished. You may visit a formerly infertile couple who’re now welcoming a newborn baby. Your practical pastoral care changes for each situation. To provide care, you also need to focus your attention on the person or the family you’re at the hospital to see. Before you enter into the hospital room, remove or silence your phone to avoid being distracted by it. Talk to them and ask about their condition. Whatever you do, give the family your undivided attention. You also show care by following hospital protocol. Use the hand sanitizer before entering the room and after you leave. If there are care procedures and policies established, follow them. If the hospital makes requirements of ministers, honor them. Your first objective in conducting a hospital visitation is to show you care. The second objective for hospital visitation is to share. Share Scripture, an encouraging word, an appropriate laugh, or even a tear. “Rejoice with those who rejoice; weep with those who weep” (Romans 12:15). Share life but share briefly. Being in the hospital is exhausting. When my wife and I were at the hospital awaiting the arrival of one of our children, one of our deacons and his wife came to visit us. We loved this couple, were happy to see them, and were glad to know they cared, but they overstayed their welcome. This made an uncomfortable situation even more awkward. The length of your stay doesn’t communicate the depth of your love. 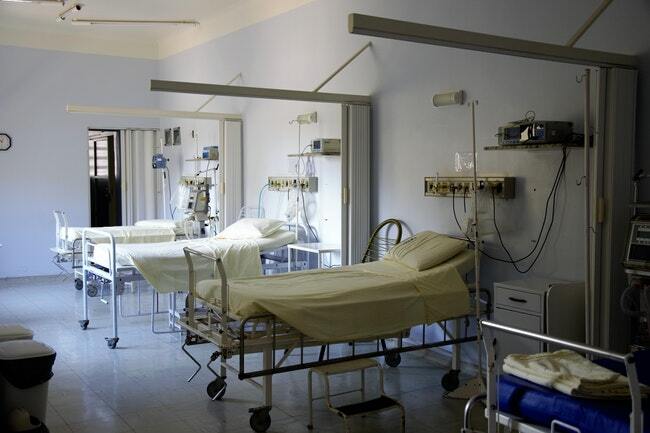 Of course, circumstances like a life-or-death surgery or a situation where someone is passing away may change your response, but in a typical hospital visitation, plan to share briefly. The third objective in a hospital visitation is to pray. Always pray with those you visit. Pray for them and their family but also take the opportunity to pray for their care providers. Not only are doctors and nurses attending to their patients’ needs, but so are nutritionist and custodians. Your time of prayer is also a time to pray for purpose in their hospital stay. Pray they’ll seek an opportunity to share their faith with those who are caring for them. If they’re dealing with hardship, grasp the promises of the Scriptures that God can work good even through their trials (Romans 8:28). You might even pray a blessing over them: “May the Lord bless you and protect you; may the Lord make his face shine on you and be gracious to you; may the Lord look with favor on you and give you peace” (Deuteronomy 6:24-26). There are other parts of pastoral ministry I enjoy more than making hospital visits. But I don’t dread them any longer. I’ve grown to love my people through them. Through the life and death situations arising from hospital visitations, I’ve learned how practical theology is in everyday life. ROB HURTGEN (@robhurtgen) is husband to Shawn, father of five, pastor of First Baptist Church Chillicothe, Missouri, and earned his doctorate at Midwestern Baptist Theological Seminary. He also blogs at RobHurtgen.wordpress.com. Previous Post: « Are American Churches Growing?